It’s also a great excuse to sip tequila and catch up with friends. But what is the relevance of this holiday to Mexicans? My efforts of late have been to separate the Cinco de Mayo “myth” from the reality. I assumed the holiday commemorated Mexico’s independence from Spanish rule. Wrong! Mexico asserted its independence from Spain on September 16th, 1810. This is the date that is the equivalent to America’s Fourth of July, and is celebrated as such in Mexico. According to various web sources, the festivities on May 5 celebrate another major battle for independence; when the outnumbered and out-armed Mexican army defeated the the French in the Mexican State of Puebla in 1862. Though Cinco de Mayo is celebrated throughout Mexico, the big celebrations mostly center in Puebla, where the actual battle was fought. If any recipe represented Puebla cuisine, it would surely be Mole Poblano, the inimitable chili pepper, spice, nut, chocolate, and tomato sauce, which is traditionally served with turkey or chicken. The only time I made a reasonably authentic Mole Poblano from scratch, I spent two days sourcing ingredients, frying peppers and grinding seeds. I morphed into “Tita”, a main character in Laura Esquival’s book “Like Water for Chocolate,” a mystical novel about a Mexican family in the early 1900’s. Initially, I romanticized the event, as I organized the 30-plus ingredients for the recipe. Hours later, after finally finishing the mole, my kitchen could have stood in as a reenactment from the Battle of Pueblo. This battle-scared warrior is too weary to take on that experience again, even for the sake of authentic food writing. My new quest was to find a “short-cut” mole that could be made in less than an hour. I turned to an expert. “Mole,” to Graciela Rubalcava , “is important.” The favored mole from Graciela’s home state of Aguascalientes, Mexico, is also the Mole Poblano. She explained mole recipes are a source of great pride to Mexicans; indeed, family heirlooms, passed down through generations. These recipes vary greatly from state, to town and village. 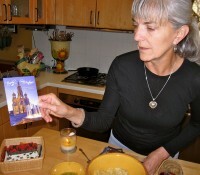 Graciela left her home in Aguascalientes to study at the University of Michigan in the 1970‘s. We “shared a cutting board” while catering a party many years ago, and I remember her deep reverence and love of authentic Mexican cuisine–the food she took for granted growing up. 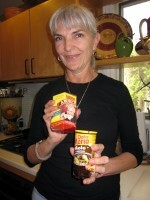 I asked Graciela if she had a really easy mole recipe she could share with us. Not exactly practical for many of us, pressed for time to even shop locally. “Are there any other simple mole recipes you can suggest?” I pleaded. With a sigh, Graciela finally relented. “When I’m short on time, I made a quickie version of mole that my family enjoys”. She opened her cupboard to reveal her “top secret” quickie-mole ingredient arsenal (recipe follows). “If you’ve the time, Rick Bayliss’ “Mexican Kitchen” has wonderful, elaborate and authentic recipes some readers may prefer. And, of course, you can find dozens of reasonably authentic recipes on-line. ” said Graciela. Discard excess oil from top of mole paste. 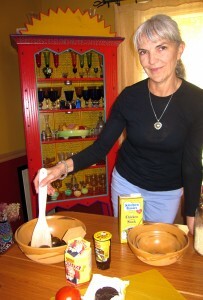 With a spoon, remove mole paste from jar and place into a large heavy-bottomed pan. Add 1 cup of heated stock to paste and, with a whisk or fork, break down paste until it has a smooth, medium-thick, gravy-like, consistency; add more stock as needed. Place pan over medium-low heat and stir or whisk in peanut butter. Add 1/4 piece of chocolate disk to sauce, whisking to incorporate. Taste and add additional chocolate as needed (I prefer using 3/4 of the disk). Stir in 1/2 cup tomato sauce. Taste and add additional sauce as desired; the more tomato sauce added, the less spicy the sauce will be. Stir mole often, scraping the bottom of the pan and sides. As the mole heats, it will thicken; add chicken stock as needed for desired consistency. Be careful not to add too much stock, which would result in a watery mole. Spoon mole on the bottom of a large platter or individual plates. 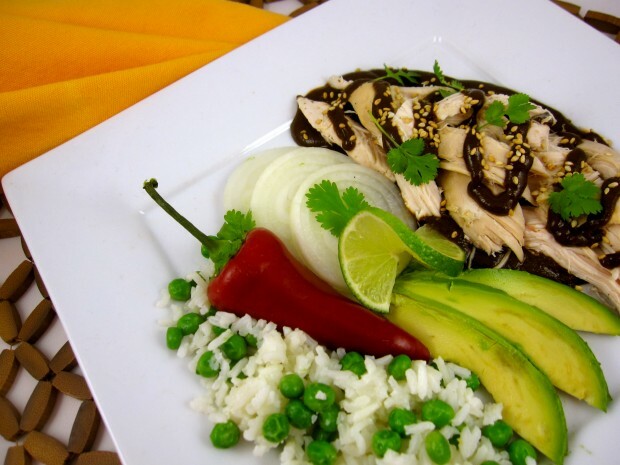 Place shredded chicken over mole and spoon or pipe mole over chicken. Sprinkle toasted sesame seeds and cilantro over chicken and serve.